Editors of the Veritas this year are left to right: Jason Golemme, arts editor, Haley Macray, web and features editor, Alexandra Pigeon and Katherine DeLorey, editors-in-chief, Cameron Stuart, sports editor. 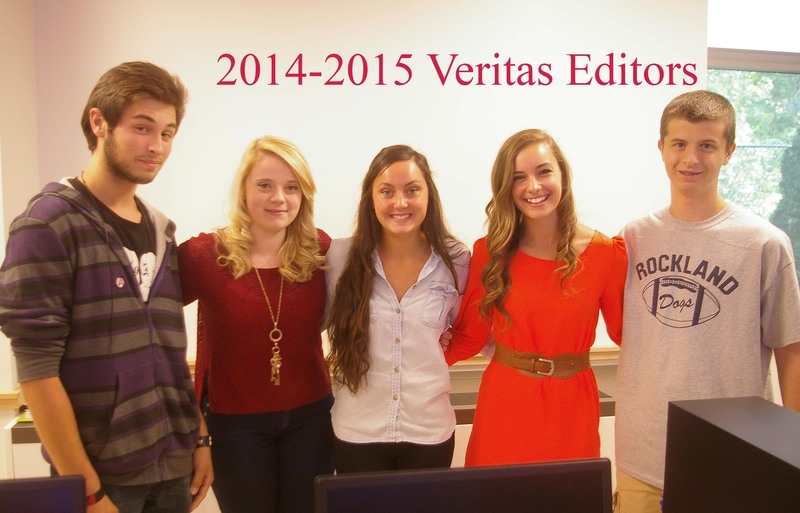 Congratulations to five Journalism students who have been selected for leadership positions on the Veritas this year. These include three seniors: Alex Pigeon and Katie DeLorey, co-editors-in chief, and Cam Stuart, sports editor. Junior Haley Macray is our web editor and the features editor of the print edition. Sophomore Jason Golemme will anchor our arts and entertainment coverage as the arts editor. We are hoping students, staff and community will contact the editors with information or ideas that we could use or cover for our website and print edition. apigeon2015@rocklandschools.org, kdelorey2015@rocklandschools.org, cstuart2015@rocklandschools.org, hmacray2016@rocklandschools.org, or jgolemme2017@rocklandschools.org.